I see I have not posted on this blog since August, and that was not about pizza. It’s not that we haven’t eaten pizza almost weekly. We have! For the final few weeks of our Roman residence, we returned to old favorites: Da Remo, La Pratolina, Dar Poeta, and of course Taverna Rossini, each previously reviewed here on OWP. Each bite reminded us how much we would come to miss the pizza in Italy. 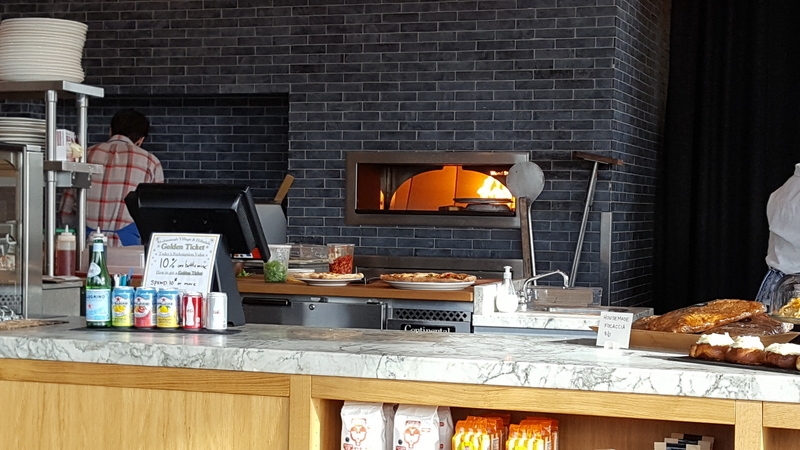 At first glance, I thought there was a wood-fired oven, but it is actually heated by gas jets. Now back in the U.S. for six weeks, we have cautiously re-entered the pizza market in Portland. Ripping the bandage off of our pizza snobbery, our son brought home Papa Murphy’s pizza the first night we were here. We used to eat Papa Murphy’s almost weekly. It’s served very hot since it is baked at home and they use good ingredients but falls far short of Italian pizza. 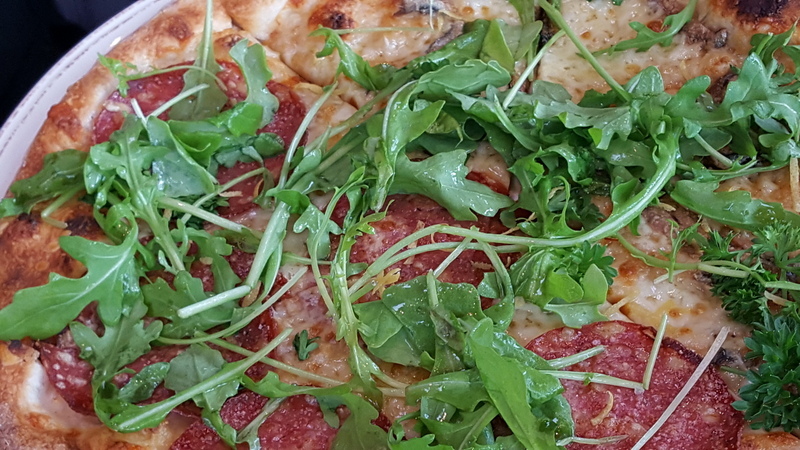 As Ric quipped, “It’s good, but it’s not pizza.” It requires a category of its own. Ric and I shared a pizza Margherita, enhanced with a liberal serving of anchovies. Last week we met friends at a newish place, Oak and Olive. Very sleek and shiny, it radiated nuovo Italian resembling some of the newer spaces built-out in Roma. A wood-fired oven is a significant factor in turning out THE BEST crust, and while Oak and Olive turned out decent pizza, the oven provides ambiance more than an improved product. The menu is far from traditional. It features some inventive pizze. (Pizze is the plural of pizza. I cannot bring myself to type “pizzas.” It’s almost as bad as “paninos.”) The chef’s inventiveness will appeal to some and send others straight to the pasta menu. I am told the lamb pizza is terrific and our friends’ roasted garlic pizza looked and smelled divine. 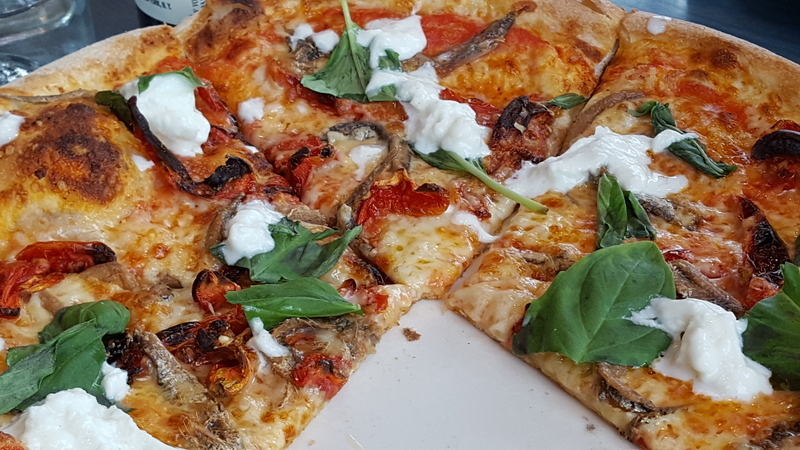 We were happy with our pizza Margherita enhanced with anchovies. The latter were rather salty by Italian standards but the entire experience supported Ric’s theory that Papa Murphy’s needs its own category. Oak and Olive produces a good pizza. Oak and Olive served the most perfect shot of espresso we have had since leaving Italy. Each couple shared a salad (two options,large and small; the small size is quite sufficient for two) and a pizza (also more-than-enough), and between the four of us just one bottle of wine. It was lunchtime and we had to drive. 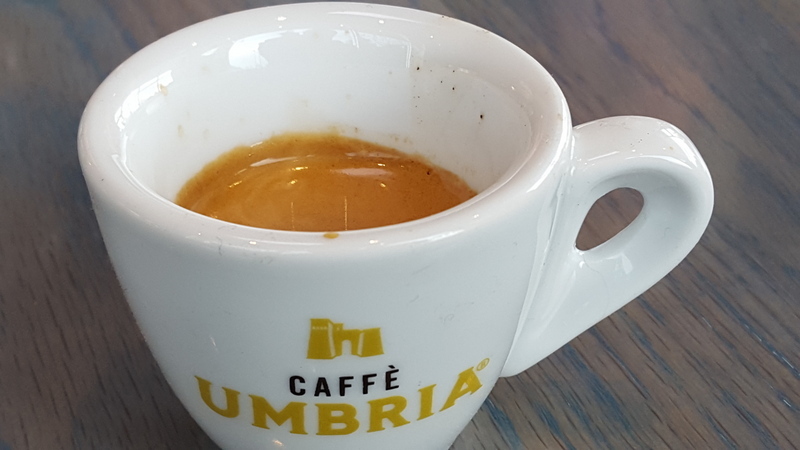 We topped off the meal with a perfect espresso. One sip practically transported us back to Roma. Well done. The bill, delivered with the coffee and no need to request it, would have sobered me up even if I had had caffè corretto: $104.00 plus tip! Two salads, two pizzas, one bottle of wine — at the “modest” price of $40.00 it was at the low end of the price list — and four espressi. Made me miss Roma even more. JC and Maarja enjoyed a Roasted Garlic pizza with the addition of salami and olives. Pizza Quality: 2 Very fresh produce, lovely cheese, and high points for creativity. The number of selections is small, though, and I cannot bring myself to give a “3” to anything that does not come out of a wood-fired oven. I loved that our pizza Margherita had oodles of basil. In Italy, you get one or two leaves. Service: 2 I am still getting used to American service. I do not want to become besties with my server and at Oak and Olive at least they did not exchange names with guests. Service felt a little uneven, though. There was quite a long wait between salad and pizza, which was fine since we were chatting away, but could be annoying to some. 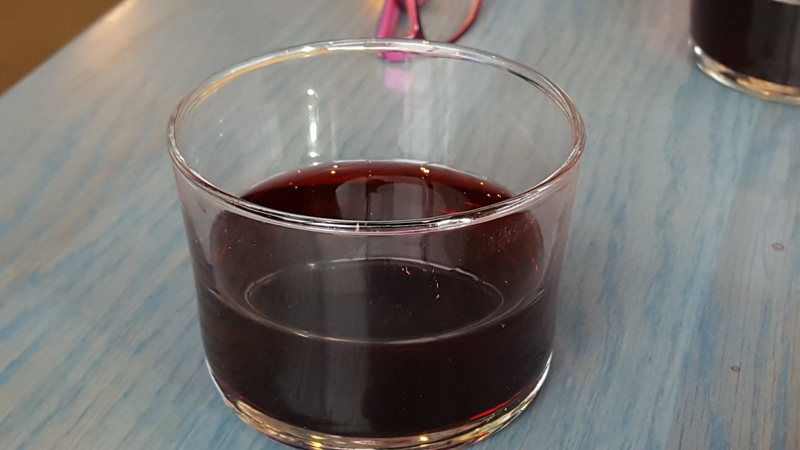 The wine glasses (see picture) are odd. Sometimes traditional is better, i.e., stemware when you are paying $40.00 for the wine. This is the Oak and Olive wine glass. Only half-full when I took the photo, the server had filled it right to the top, which would be nice for a bar pour but is very odd when one has purchased a bottle. It would make a nice condiment dish for serving ketchup. Ambiance: 3 Attractive and sleek, I liked it. At night, when the place is full, it might be a bit noisy, and the huge expanse of glass might make it a little warm in summer, but at this visit, I liked it. Ah, Carolyn, that would be work. Not happening. But I’ll keep on trying pizzas and posting about them! I like Bill’s suggestion! That gorgeous new kitchen in your new home must have room for a woord burning oven! At least, this place had anchovies! Thank you for the review. Keep them coming. We had a similar experience in August 2014 but the bill was about $50 PER PERSON for pizza at Nostrana in Portland. The wine prices are ridiculous. At least this makes traveling to Europe look like a reasonable thing, especially if teh exchange rate stays so positive for us! I’m confused. $104? OK, €16 for each pizza = €32. 4 espressi, €4. OK, double it because it is a novelty. €8. So we’re up to €40, and $40 (!!!!!?????) for a bottle of wine. Mix dollars and Euro and we’re up to $80. Must have been good salads. Seriously – prices must have shot up in the 20 years since we last visited the US. As you know, we don’t drink, but $40 for a low end bottle of red? $40 used to buy the best champagne in the place……. And they say London is expensive. You should start/manage your own Pizzeria da Barton – I am sure it would meet the standards of bella Roma! Good food attracts good people.